The first Indonesian Mission in Dhaka was established as the Consulate General covering East Pakistan, as Bangladesh was known back then. Following Indonesia’s recognition of the independence of Bangladesh on 25 February 1972, the Embassy of the Republic of Indonesia in Dhaka was formally established on 1 May 1972. The Embassy was located in a rented premise at 75 Gulshan Avenue, Dhaka. The first Ambassador of the Republic of Indonesia to Bangladesh was His Excellency Haji Maimoen Habsjah, who served from 24 November 1972 to March 1976. Since its establishment, the Embassy has been led by 12 ambassadors; the current Ambassador, H.E. Mr. Iwan Wiranataatmadja being the 12th. The Embassy’s premise moved permanently to the current premise in Gulshan-2 in 2000. 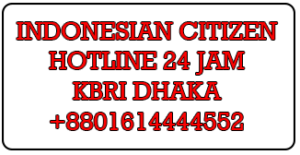 The Embassy of the Republic of Indonesia in Dhaka has been concurrently accredited to Nepal.